A backlog of unfinished “Yale Bowls” in Scott Strobel’s workshop. Photo by Sarah Hill. Yale Professor Scott Strobel with a finished “Yale Bowl.” Photo by Sarah Hill. About a decade ago, Strobel was looking at buying furniture and was underwhelmed by the options. At the same time, his successful academic career moved him farther away from having hands-on time on the bench. That’s when he took up woodworking, recalling fondly his time at a lathe in high school. Converting his wife’s garage to a woodshop, he collected large chunks of a walnut tree that had fallen on campus, milled it, and built the lovely, salvaged wood into a coffee table and television stand. You can see his shop and process in this video. After this experience, he became more interested in harvesting the historic trees around the New Haven, Connecticut campus. Some trees, too small to mill and turn into furniture, became the perfect candidates for pens and bowls. Now, fallen trees mobilize a network of arborists and groundskeepers who appreciate his craft. Today, his Yale Bowls comprise a bustling side business. 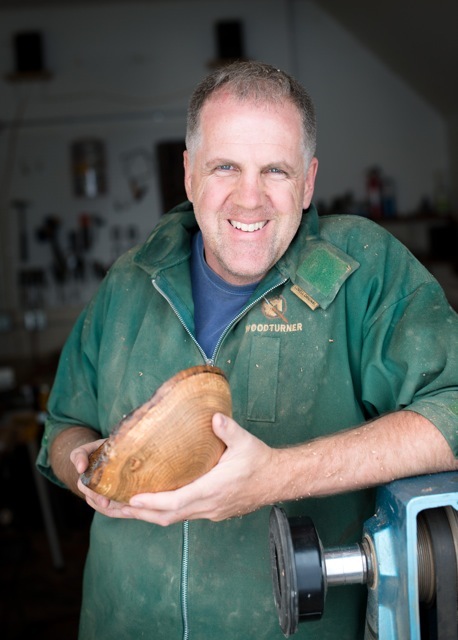 He pairs each unique final product on his website with a photo of the tree whose wood was used in the pen, bowl, or other hollow form, along with the tree’s species, age at harvest, and trivia about where the tree once stood, tapping into the city and campus’ centuries-long history. He carefully researches these backstories in the archives of Yale and the Elm City. Unique features, like the wood’s knots or bark occlusions (bark buried in the wood), tell you which way to go with the design. When you cut the log in half, you can see right away if it is going to have a nice shape with a natural, barky edge, or if it will be better to flip the shape and create a regular, finished bowl with a smooth edge. You have more control over the shape when the bark edge is not the top edge. 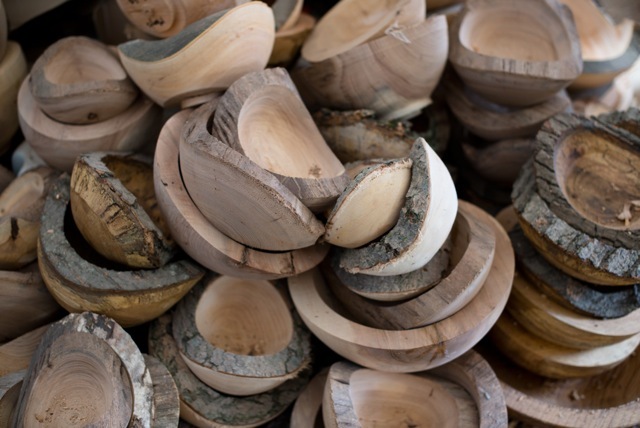 Because the bark is the tree’s skin, those bowls that include the bark in the top edge have greater sentimental value for the eventual recipients of bowls. “It’s a different kind of creative construction,” he continues, “like a deconstruction—tearing the wood away. I’ve tried to do pottery, and it feels completely backwards.” The bowl-turning differs from the biologist’s hands-on time at the lab bench, too. While fine woodworking and bio experiments both require a certain level of precision, with many steps done in a particular order, when running a lab test, a researcher must focus for days, while in the woodshop, you can focus for a couple of hours and walk away. Many bowls take a year to go from harvest through a long air-drying to finished bowl. 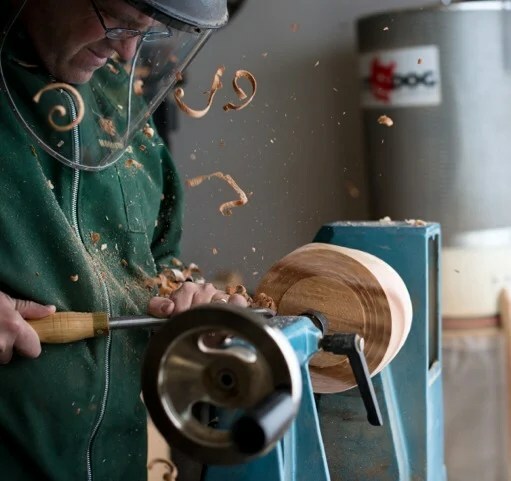 Yale Professor Scott Strobel at work turning a bowl. Photo by Sarah Hill. Strobel learned his craft by taking a week-long course from Craft Supplies USA in Provo, Utah. If you want to get started making bowls from your neighborhood, he wholeheartedly recommends their classes. But if you’re a skilled woodworker, you can also learn a lot by trial and error in your woodshop. With about $1,000 you can equip yourself with all you need to get going: a moderately priced lathe, a chuck to hold the wood, at least one bowl gouge, at least one spindle gouge, and the safety equipment. Start with wood that’s a little wet, not a piece that has been kiln-dried—maybe a tree that was cut down last week, or a few weeks ago. “You’ve got a lot that you’re fighting,” he advises, “and slightly wet wood makes it easier.” Avoid pine which is soft and has a lot of resin and woods that are sappy.